Installing a new roof is a crucial piece of having a home that not only looks great but that also has full coverage from the crazy things that mother nature throws our way. We are frequently asked whether we can install roofs year round, or if there’s just one season that we offer our services during. The answer is yes! Colorado is known as the sunshine state because we get more sunshine than any other state in the US. That makes it ideal for us to work on roofs throughout the seasons. There are, however, some days that conditions make it impossible or difficult for our team to work on a roof. 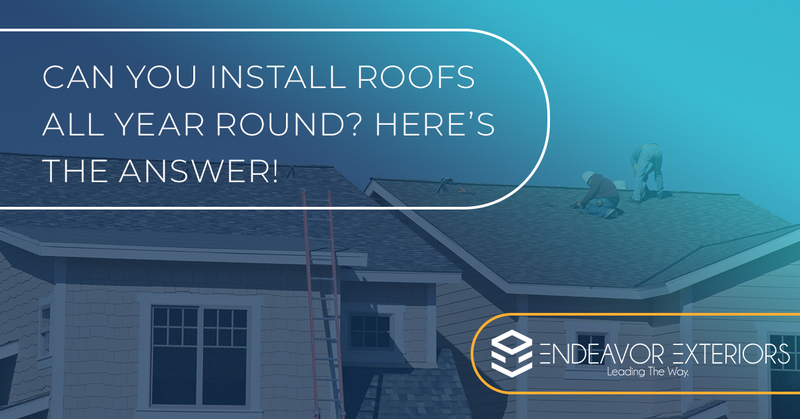 Keep reading to see a few of the factors that determine whether or not we’re able to install a roof. One of the biggest factors in whether or not we can install a roof for you is going to be the temperature outside. The temperature not only contributes to the conditions that our team is able to work in, but it has a huge impact in the materials that we’re using and how well we’re able to install them. Normally, our team likes to work when temperatures are no lower than 40 degrees. This ensures that we’re able to be comfortable for longer periods of time while we’re outside, but it is also the temperature where sealant dries best. Another concern that we have to look into is what the weather will be like. There are plenty of sunny days where there is still fresh snow that we need to worry about. If there’s snow on any of the areas that we’ll need access to in order to get the job done, you can imagine that we are going to wait a little longer. The moisture and the conditions make it difficult for us to do our best job. Given that it’s tough to really schedule or anticipate what snowfall will look like, we often suggest scheduling roof installations when there’s very little chance of snow so that projects don’t get put off. The materials that your roof is made of are intended to be durable enough to handle all of the crazy weather that you’re sure to encounter. From hail to snow, your roof is meant to stand up to it. Though this is the case for a majority of roofing materials, it’s not suggested that the installation process happen when temperatures are too low. Not only can certain types of shingles crack or break from temperatures being too low during the installation process, but it’s also extremely difficult for the sealant to set when it’s too cold out. This is something that we take into consideration when deciding whether or not we’ll be able to install a roof. We strive to provide you with a properly installed, high-quality roof, and we can’t do that when temperatures are less than ideal. We’ve talked a little bit about how moisture can affect roof installations in the winter, but that isn’t the only time that moisture is in the air. In the last couple of years, we have had some of the worst hail storms in the history of the state. These storms have left windows broken, siding dented, and roof shingles scattered across the yard. We’ve seen some heavy sleet and rain accompany these hail storms too. When there is too much moisture in the air or on your house, be it from a snowfall or a hail storm, our team isn’t able to work on your roof. Moisture is a huge issue when installing a new roof. It makes it difficult to work and can affect the effectiveness of the materials. Always trust that your roofer knows best if they tell you that your roof’s foundation is too wet for them to work on at the moment. When you’re in the clear with the weather, and you’re in need of reliable roofing services, contact Endeavor Exteriors. Our team has been a part of the industry for years, and we are proud to say that we’ve helped hundreds of homeowners in the Denver area with their roofing needs. Contact our team today to inquire more about the services that we offer or to schedule a consultation on your roof.